Winter break is over and school is back in session for University of Pittsburgh students. Now is the perfect time to get started on your search for off-campus housing in Pittsburgh. The number of searches peaks in January so be sure to start looking right away. As the spring semester continues, housing fills up. The sooner you start looking, the less stressed you’ll be. After all, nobody wants to spend their summer break scrambling to find a place to live! Rent prices in Pittsburgh can be on the more expensive side, but if you look into your options you can certainly find something affordable. Living with a few roommates is going to be the most cost-effective, and it’ll help you keep some extra change in your pocket. A lot of the housing options in Pittsburgh near campus are apartment complexes, which is nice, because you have several choices that offer a vast variety of amenities and sizes. There are houses nearby but there aren’t as many so start contacting landlords immediately if you’re interested in renting a house! Meeting up with friends to grab some food and drinks is a favorite pastime among Pitt students. Often times, students head to one of the many restaurants right around campus. The nearby Forbes Street is home to many of the most popular restaurants and bars. There are also numerous other hangout spots near Forbes Street. Being close enough to walk to these bars and restaurants make it convenient and ideal for most students. However, free public transportation and Uber make it possible for students to enjoy the cuisine and nightlife all over the city! If you’re looking to get involved on campus, the Pitt Outdoor Club is a great organization for any outdoor lover to join. They plan activities like hiking trips to McConnells Mill and tree planting sessions at various parks around Pittsburgh. Schenley Park is a popular place you can find students tossing frisbees or footballs or soaking up the sun on the lawn. Head to Point State Park for a day of kayaking the Monongahela River. Visit the Phipps Conservatory and Botanical Gardens and relax while walking through the different nature exhibits. Pittsburgh has a lot to offer and there are plenty of adventures waiting to be had right outside your door! When it comes time to relax and take a break from homework and studying, students at the University of Pittsburgh have a variety of activities to do to unwind. Like most college campuses, sports are huge! Heinz Field is home to not only the Pittsburgh Steelers but also the University of Pittsburgh’s Division 1 Panther’s football team. Join thousands of fellow students and fans each week and tailgate before the game. Students at the University of Pittsburgh receive free bus transportation around the city, creating endless activities. Head to Mount Washington and take the incline up for breathtaking views of the city or visit the Andy Warhol Museum. Students are also admitted free access to the popular Carnegie Museum of Natural History, which is conveniently located near campus. On campus, there are tons of different activities to immerse yourself in, like visiting the famous Cathedral of Learning (which is rumored to look like Hogwarts, if you’re a Harry Potter fan). You can even catch students playing a game of Quidditch on the lawn outside. The Pitt Program Council conducts several activities like bowling, skiing, and movie nights throughout the year so check that out. Whatever your interests may be, there is something for everyone in Pittsburgh! Home to the University of Pittsburgh, Oakland is Pittsburgh’s third-largest neighborhood that is divided into four different sections: North Oakland, Central Oak, West Oakland, and South Oakland. As a whole, Oakland is most known as the medical, academic, and cultural mecca of the city, while also housing the majority of the student population in Pittsburgh. This neighborhood is one the liveliest with several museums, cool shops, and cozy cafes to keep you busy. Each section, however, has its own individual characteristics that make them unique. 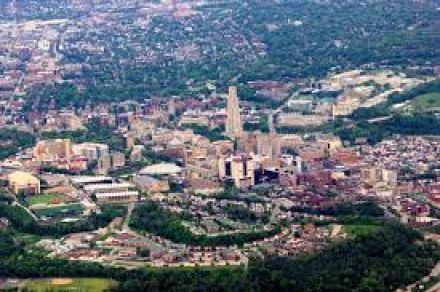 North Oakland: Running through Posh Hill, North Oakland is most known for being home to the majority of the buildings that make up the University of Pittsburgh campus, The Cathedral of Learning, and the Craig Street business district. Central Oakland: Boarding Schenley Park, Central Oakland is where most students living off-campus choose to live. Nearly 75% of the people living here are between the ages of 18-24. In this area, you’ll find several shops and restaurants. West Oakland: Out of the four districts, West Oakland is the smallest. Here you’ll find the University of Pittsburgh Medical center. South Oakland: Childhood home to both Andy Warhol and NFL Hall of Famer Dan Marino, South Oakland runs along the Monongahela River. 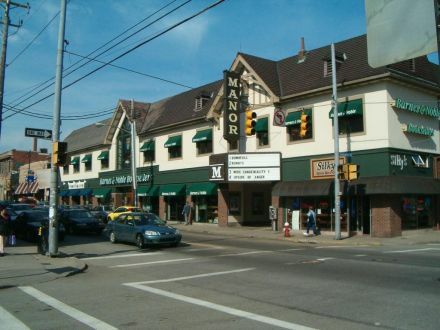 The major landmarks in South Oakland are the Pittsburgh Technology Center and the Magee-Women’s Hospital of UPMC. Just north of Oakland is the Bloomfield neighborhood. Full of compact row houses and alleys, this section of Pittsburgh is the city’s Italian neighborhood, commonly referred to as Little Italy. Here, the streets are lined with Italian restaurants, bars, and markets. Yearly, Little Italy Days is held to celebrate the rich heritage. 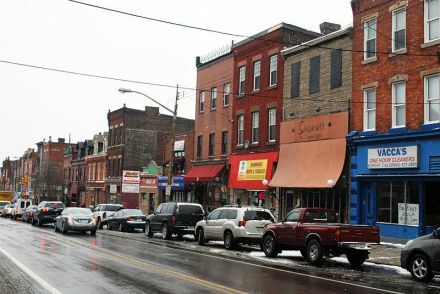 Over the past years, Bloomfield has started to become a more popular student living destination as the area is referred to as being “hip.” If you choose to live in Bloomfield, having a car isn’t necessary. Getting to classes at the University of Pittsburgh is about a 1.5 walk or bike ride. Taking the city bus is also a quick and convenient option. Getting its name from a 19th-century Pennsylvania Railroad Station, Shadyside was named the best neighborhood in Pittsburgh for millennials, by Niche. Tree-lined streets pave the way to the many galleries, victorian homes, and restaurants. Walnut Street is the center of Shadyside and offers boutique shops and larger retail shops like American Apparel and Victoria’s Secret, just to name a few. Each year they host The Jam on Walnut concert to highlight the region's best music. Take your four-legged friend along with you wherever you go because most shops and restaurants in Shadyside are dog-friendly. Even though a lot of Shadyside has been updated and modernized, Roslyn Street is the last wooden street in Pittsburgh which is made up of almost 26,000 wooden blocks. Head coach of the Pittsburgh Steelers, Mike Tomlin, also resides here and has been the first Steelers coach in a half century to do so. 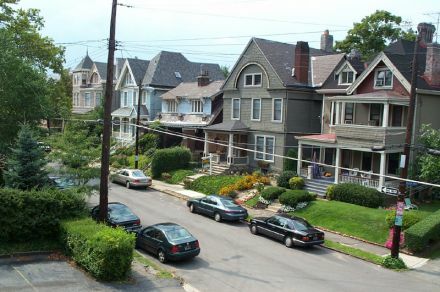 Squirrel Hill is divided into both North and South sections, but to most, they are treated as the same neighborhood. Located just south of Shadyside and east of Oakland, Squirrel Hill, which as you might have guessed, by its name, is located at the top of a hill five minutes outside of downtown Pittsburgh. Described as commuter friendly, cultured, and laid-back, Squirrel Hill is a great place to take a walk down “Upstreet” and check out the local shops and get a bite to each at one of many local restaurants. Try something new because this neighborhood is said to have the city's best ethnic restaurants. For years pizza joints, Aiello’s and Mineo’s, have battled to be the best pizza spots, do a taste test and help decide the winner! Central Oakland borders Schenley Park, but the majority of this park is in Squirrel Hill and so is Frick Park, With 1100 acres of parks, residents can enjoy several activities like the popular Blue Slide Park where people take cardboard and slide down the hillside. Just outside of downtown, running along the banks of the Allegheny River is the Strip District. Back in the day, The Strip District was an industrial area and home to several mills, foundries, and wholesalers. After several years, these businesses declined and left. 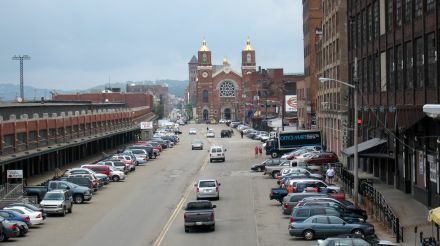 Fast-forward to today, The Strip District has become one of the most popular shopping areas, and now has many international retailers and some of the top rated restaurants in Pittsburgh like Primanti Brothers. The abandoned warehouses have been revived and new nightclubs, housing, and bars have emerged.